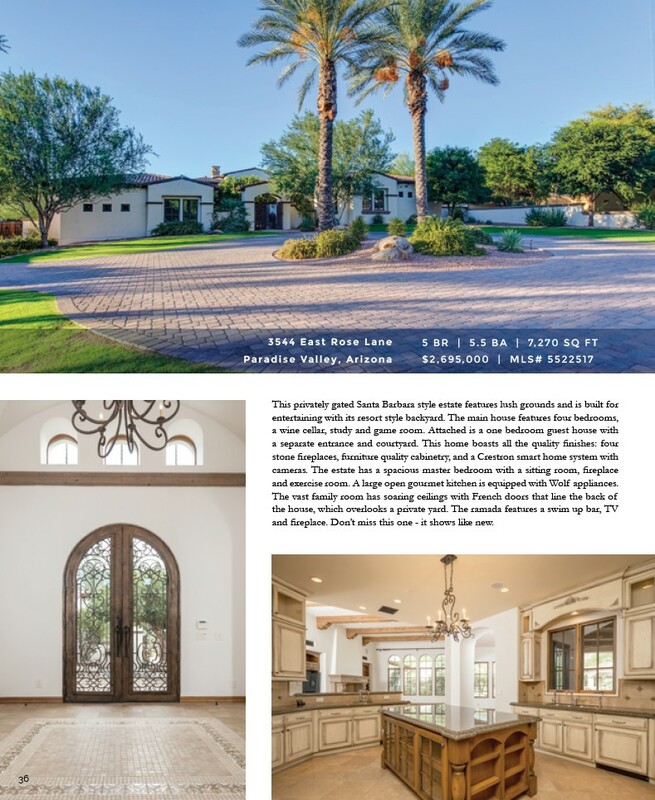 36 3544 East Rose Lane Paradise Valley, Arizona 5 BR | 5.5 BA | 7,270 SQ FT $2,695,000 | MLS# 5522517 This privately gated Santa Barbara style estate features lush grounds and is built for entertaining with its resort style backyard. The main house features four bedrooms, a wine cellar, study and game room. Attached is a one bedroom guest house with a separate entrance and courtyard. This home boasts all the quality finishes: four stone fireplaces, furniture quality cabinetry, and a Crestron smart home system with cameras. The estate has a spacious master bedroom with a sitting room, fireplace and exercise room. A large open gourmet kitchen is equipped with Wolf appliances. The vast family room has soaring ceilings with French doors that line the back of the house, which overlooks a private yard. The ramada features a swim up bar, TV and fireplace. Don’t miss this one - it shows like new.